Yesterday MB ran a 10k. But actually he ran 11.75k. Well yes. That’s exactly what MB did. But allow MB to explain some more. Few days back MB went on the Dubai Marathon website to check out his entry for the 10K event on same day. MB entered various forms of his name but nothing was showing. No ‘M’. No ‘B’. No ‘MB’. So MB called the contact number and left message on the answering service. The answering service had some lady with American accent telling MB what to do and how to leave a message. MB explained to the electronic American lady that no ‘MB’ was appearing on the entry list. Following day MB gets the call back. Somehow, MB had cocked up his online entry for the race. Entries were now closed. So that was that. Whilst such a scenario might have upset most runners on the planet, MB saw it in different light. The goal was never the race. There were over 10,500 entries in the 10k, MB is well past his prime, and ‘race’ didn’t really enter the scheme of things. MB’s only goal was to try to run 10k without stopping. Full stop. If he broke one hour in so doing then that would be the cherry on top (he didn’t as it happened). So MB just decided, what the heck – the 10k route wasn’t going to disappear. It was mapped on the website, and MB would just do the run either before or after the official event. Screw and numbers across his chest and the memento T-shirt that all the entrants were getting. So that’s exactly what MB did. MB landed in Sharjah airport on Thursday evening. A camera flashed as MB entered the baggage area and MB felt like Usain Bolt for a moment. Until he realised it was some mom taking pic of her son with her camera phone. Still, it set the mood and MB was starting to feel the buzz. Hired a car from MB’s regular car rental company called Thrifty and out of that airport like the wind. Stopped off for some pasta at a Pasta joint, because that’s what Crosser & ‘all things running’ TOC told MB last week. “Plenty of pasta in the days leading up MB, now don’t you forget”. MB didn’t forget and wolfed back the pasta and a diet Pepsi. Onwards to MB’s apartment. Flat mate was doing some entertaining but informed MB that dinner was finished. “But how about a crispy bacon sandwich on some fresh bread, with a large glass of whiskey to wash it down?”. MB didn’t mention a word about the pasta of 15 mins earlier. MB had just arrived from Saudi Arabia where a bacon sandwich or a glass of whiskey could result in 300 lashes in a public square with all the local lads looking on and wishing the lad doing the lashing would lash the infidel even harder. “You betcha” said MB, and moments later MB downed one of the finest meals of his entire life. Very thinly sliced American bacon in ‘just out of the oven’ bread and a large tumbler of Jack Daniels. No ice, no water. Just like God made it. Followed by another tumbler to wash down any molecules of the sandwich that tumbler Nr 1 had missed. With fuel like this though MB, he could do the 10k on his hands. Doing it by traditional running was going to be a breeze. The only slight nagging feeling of doubt that MB had about achieving his 10k goal was that he had, in effect, done no running training. And this is generally not a good plan. It’s over 20 years since MB’s football career ended. 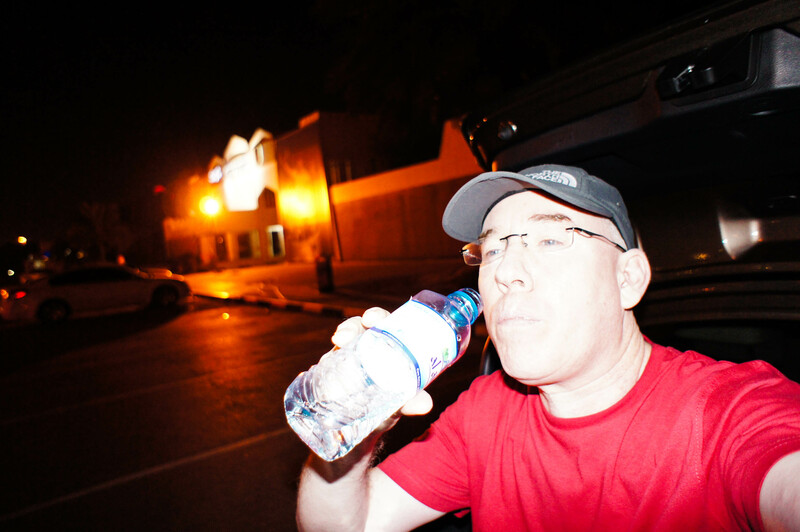 A few days exercise per week in the Saudi hotel, and 3 days of running practice at home over the Christmas holiday was not your traditional preparation for a 10k run. Or so the running gurus would have you believe. And the running books. And the running videos. And even TOC would agree that fail to prepare = prepare to fail. But MB suspects that no past studies on running have ever factored in the potential positive impact of a bacon sandwich and two tumblers of JD on pre-race night. So ‘perturbed’ was not what MB was feeling. No Siree. Far from it. 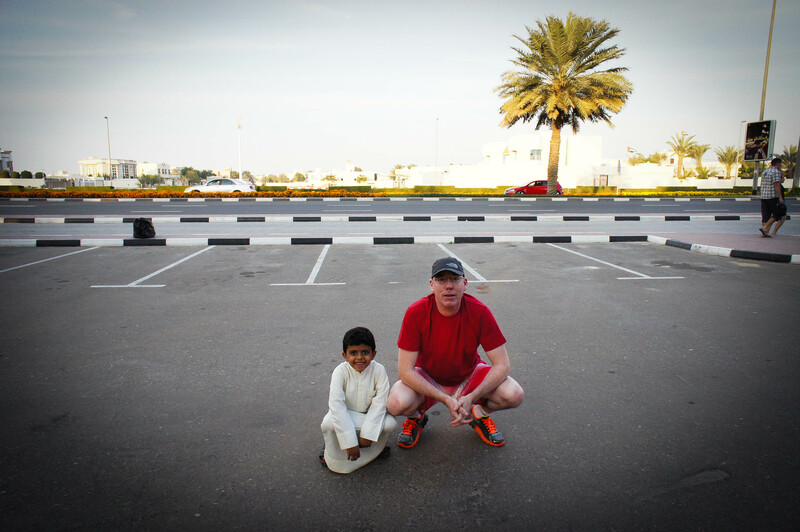 MB had few things to do in Dubai following morning and found the city bulging with tourists. MB knows when they are about in large numbers because a large percentage of drivers are breaking suddenly in front of you as they realise they are lost, or almost too late to take the exit, or want to do an immediate ‘Ueey’ to head in a different direction. So MB had to hit the brakes suddenly 4 or 5 times that morning and prayed that the driver behind him hadn’t consumed too much JD the night before. Unlike MB. Who had consumed the exact correct quantity. No question. But braking hard is a tad stressful on ’10k’ day. N’est pas? Mais oui MB. The official race had taken place that morning. MB headed off late afternoon and arrived at the official start just before sunset. Right next to Dubai’s iconic 7 Star hotel called the Burj Al Arab which looks out onto the Palm Island on the Dubai coastline of the Arabian Gulf. MB’s pulse was racing a little as he did about 1 minute of stretches before the off. MB made last-minute decision to carry his phone in his hand during the run on account of fact he recently downloaded an app called RunKeeper, and this would give MB regular updates on distance and times, allowing MB to pick up the pace, if he had the wherewithal to do so. As it transpired MB did not have the wherewithal to increase the pace, but the app was great company, even though it seemed to be using the same irritating electronic American lady that the Marathon website was using. Big demand for her services it seems. Lucky her! MB headed off and the early stages were a doddle along the sea-shore. The markers from the official event were still in place so MB jogged along, pleased as punch with himself. But then the official markers and direction signs suddenly disappeared. The subcontractors were already out on the streets removing everything removable and MB was trying frantically to remember the route from the briefest of glances he had given the website the night before. Alas MB took a wrong turn which resulted in running for 2k through Dubai Marina new metro line construction site, on rough terrain, and MB now realised that he should have taken an earlier turn and would now cover some extra distance. 1.75k extra distance to be exact, as RunKeeper informed MB at the end. So all in all a success. 11.75k completed without stopping on the route (more or less) of the official event. MB wishes to express his grateful thanks to his sponsors – the American Bacon industry and Jack Daniels distillery, both organisations with huge potential in the world of sport. But in all probability neither organisation is yet aware. What next? A full marathon? One of those Iron Man events? So much for MB to ponder in the coming weeks and months. MB got back to his car, took a swig from his water bottle, thanked the Gods for getting him to the finish – and took a selfie! Take care all. Chat next week. Never done an 11.75 km run though! Hi Miss Gypsy! Happy New Year to you & yours. Am now thinking about a half marathon. Maybe! But will have to take that a little more seriously and actually try some training – real training! Keep well. Nice to meet you. Thanks for the nice comment!